'Sons Are Shits' is a groundbreaking treatise on the tribulations that mothers of Indian extract face on a daily basis. it is a follow up to the critically acclaimed Daughters Are Diamonds. As a study, it sets out to define these questions: How are the Head-aches, challenges and obstacles facing South African Indian Mothers within the family, perceived and experienced by the individual? To what extent, if at all, does traditionalist culture create/influence raising lazy delinquents? The journey has been one from research manuscript to published work with little encouragement and no interest from all across the world. 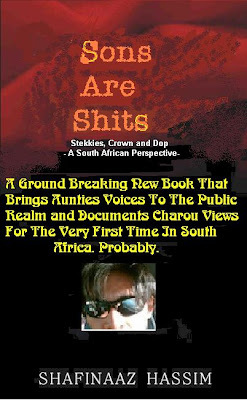 Amid zero ambiance, "Sons Are Shits" was launched on Christmas 2008 at various Nandos around South Africa including the branches at Overport and Springfield. Articles have been scarce and debates nonexistent. More than two thousand books have been distributed (for free) since it first came off the press. We are optimistic. I went to my local nandos and requested the book. The guy gave me a perplexed look and told me to go to virgin megastore for books cos they only sell chickens. But then i remembered a year ago when i called to order a quarter chicken meal they told me they don't have chickens! I'm bewildered.